These pieces are no shine and all style. ​The little black dress or LBD has been a staple in women's wardrobes for decades. Black has always held a sacred place in fashion—but we can't overlook its parallel role in interior design. From fixtures to floors and furniture, black home design elements add an element of sleek, modern sophistication. Lately we've noticed that the latest iteration of black to sweep the fashion and beauty world—matte black—has influenced interior design as well. DIY enthusiasts have embraced the ability of a dull, shine-less black paint to completely makeover any piece in their home, and designers and brands have adapted, too. The way we see it, any room in your home can be enhanced and upgraded with some matte black elements. You can go big—we found the most gorgeous matte black claw foot tub—or small (think flatware and table clocks), just don't miss out on this trend. Ahead we hand-selected 15 matte black finds for your home. This flatware is so chic, you'd feel decadent using them to eat leftover takeout. Therefore, it should go without saying that this 12-piece set will add some major style points to your next dinner party tablescape. Want to stop your houseguests dead in their tracks? This matte black fridge will instantly become the centerpiece of your kitchen, and has to be one of the boldest uses of matte black in home design... Maybe ever?! There was a time not so long ago when ceiling fans were the most reviled element of any "fixer upper" room. Thanks to Pottery Barn, though, the lowly fan has gotten a sleek and stylish makeover. Staying cool never looked so good. It's one of our favorite "design secrets" that Target is a haven of stylish, affordable home finds. Perhaps more than anything, we love their in house brands' collections of lighting and lamps. Case-in-point, this double table lamp in copper and matte black. While not exactly purposed for travel, this vintage-inspired trunk would make the perfect design accent (and storage container) in any room. Stack it on top of another vintage trunk or decorate the top with found objects and candles. At your breakfast nook or around the dining table, these Eames replica chairs are bound to make an impression. To give each on some individual flair, add a sheepskin throw or printed throw pillow to the seat. A wedding registry, staple, it was a revelation when KitchenAid began making their classic mixer in a rainbow of colors. Naturally, our favorite is this sleek chrome and matte black iteration. Hot hot hot! This has to be the most stylish kettle in existence, and no wonder that it's specially designed for pour-over coffee. Grand and rustic—those are the perfect words to describe this matte black and rope chandelier from Elk Pearce. The exposed bulbs give it a modern feel that could easily translate from cozy cabin to cool compound. 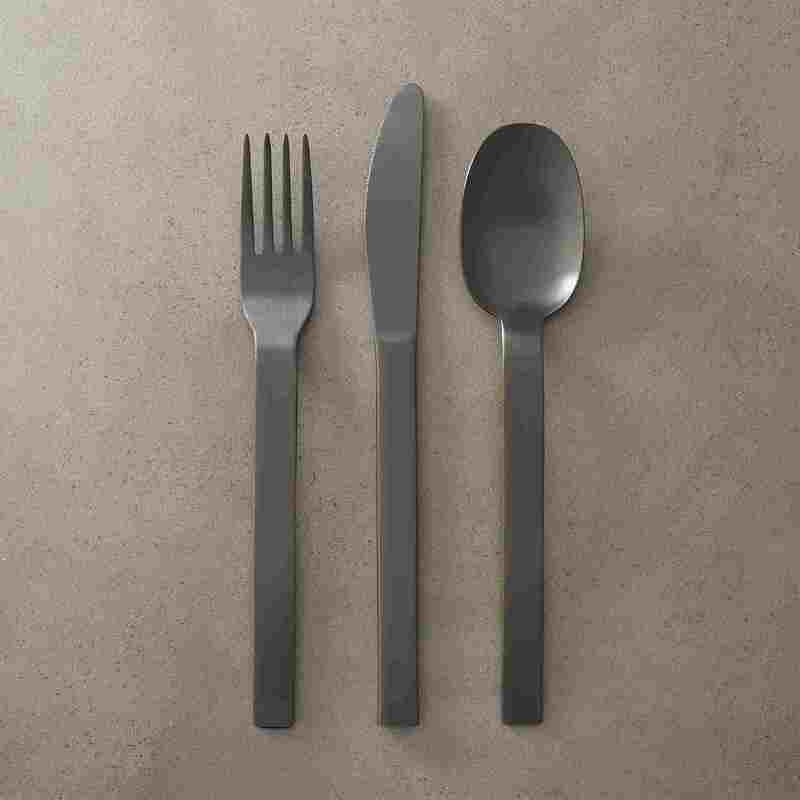 Add a little edge to your usual dinner table setting with the 'Marin' collection from Crate & Barrel. Mix these matte black plates, bowls and mugs with your usual white set for a film noir-feeling table with a dash of whimsy. Taking a page out of KitchenAid's book, Betty Crocker's 2-slice toaster in matte black would make an edgy addition to any kitchen counter. If your backsplash or bathroom floor is overdue for an update, try a touch of matte black tile. We love how this mosaic tile looks contrasted with stark white or marble countertops. Dip your toe in matte black trend with this simple and striking table clock from Kaede. If nothing else, it'll make hitting 'snooze' a more pleasant experience.